Greenlightlady posted some wonderful photos of spring flowers. 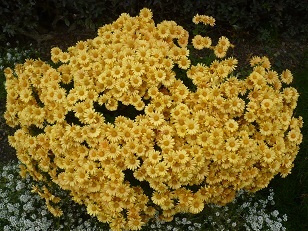 She inspired me to share this photo of one of my favourite fall flowers, a bright yellow mum (chrysanthemum for purists). This gorgeous flower, framed with white alyssum around its bottom, radiates a brightness from its place that comes close to unbelievable. How can a spiritual person avoid seeing the artistic finger of Creator looking at the complexity and balance and contrast that these two plants give to one another? I’m convinced it shows how followers of The Way compliment each other, and while each has its own beauty, together the beauty magnifies into a gorgeous sight. “Consider how the flowers grow. They never work or spin yarn for clothes. But I say that not even Solomon in all his majesty was dressed like one of these flowers” (Luke 12:27 God’s Word). Live like the beauty you are under the Master Gardener. Here in Ontario our growing season is well defined by winter, though it is not so long as it is in the north. Happy planting, flowers and spiritual seed! My wife and I love flowers. We will be planting again soon here in the south of the USA.